FAQ | K9 Cabin Dog Day Care | Augusta, Maine. Where Is the K9 Cabin? We are conveniently located on the Leighton Road between Civic Center Drive and Western Avenue. What exactly is Dog Day care? 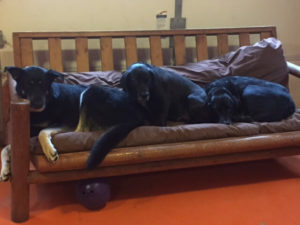 Simply put, dog day care is an establishment where dog owners can bring their canine friends to congregate and play together while being supervised by experienced dog handlers. 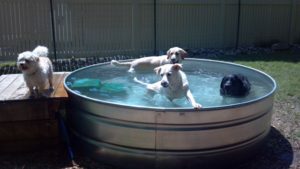 Dog day care differs from pet sitting or kenneling in that the dogs are allowed to play with other compatible dogs off leash while getting exercise and socialization in a safe, fun neutral location. Dog day care gives your dog a safe and constructive environment in which to conjure up activities to do. At K9 Cabin, there are many toys and a wide variety of playmates to keep your dog entertained all day long. 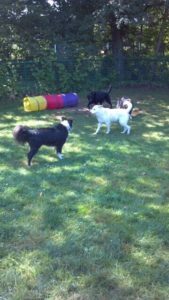 We have two different playgroups so your dog may engage in the same group or different groups throughout the day. 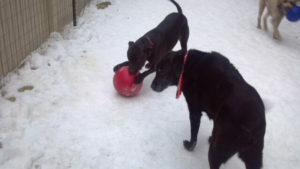 Group selection is determined by your furry friends play-style, energy level, disposition and physical size. Please keep in mind that the doggie day care environment is simply not for all dogs. 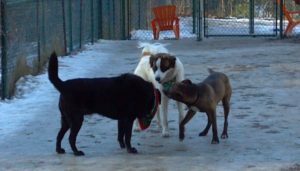 Just like people, dogs all have distinct personalities, and some personalities and temperaments are better suited than others to the “pack” life in daycare. Staff at the K9 Cabin will ask that you schedule an informal “meet & greet” interview to evaluate whether day care would be a positive and fun experience for your dog, during which we will ask you some questions about your dog’s behavior and temperament. Why should I take my best friend to the K9 Cabin? First and foremost, we are Cage free! The purpose of dog day care is to provide mental stimulation, physical exercise, positive socialization, create confidence, and in some cases, training, to a dog who might otherwise be left at home alone. Many dogs are isolated at home for lengthy periods of time throughout the day and busy owners often are unable to supply the amount of exercise and interaction their dogs require. If your dog is able to burn off energy playing with his/her friends all day, he/she is likely to not develop inappropriate behaviors. Without sufficient interaction, dogs sometimes develop destructive behavior problems such as chewing, digging, incessant barking, or regression in their house training skills. Without the opportunity to interact regularly with others of “their own kind”, dogs often are socially inept, fearful, and/or aggressive. K-9 Cabin provides the opportunity for exercise, socialization, and mental stimulation a dog needs in a fun, safe, and supervised environment. Your dog will come home tired & happy, and you will be at peace knowing your best friend had a fun filled day while you were otherwise occupied. No more guilt, no more furniture or yard repair, and you will feel relieved about doing something constructive and fun for your four-legged family member. In addition, we have two outdoor play areas, an open grass/crushed stone area, as well as a wooded 1/4 acre, totaling 22,000 square feet. So the dogs can play in the shade and around the trees. 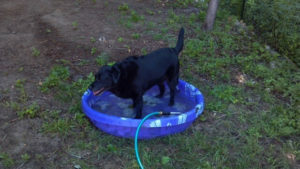 We also have 307 gallon round metal pool with entry and exit steps for refreshing cool downs on hot days. What will my dog do at the K9 Cabin? 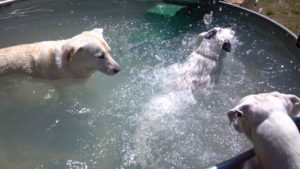 While at the K9 Cabin, your dog will spend the day playing, both indoors and outdoors, swim in the pool with other dogs, play king of the pyramid while being supervised by professional dog daycare handlers. 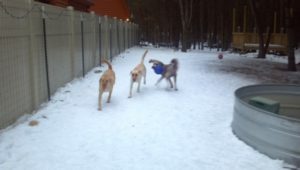 The typical day at the K9 Cabin is very casual and the dogs are allowed to play as much or as little with the other dogs as they wish. There are a wide variety of toys to play in or with and “king-of-the-mountain” games in the winter. We often have birthday parties, anniversary parties, and lots of fun days such as Halloween. We are closed from 11:30 to 1:00 p.m for nap time, when everyone is supplied a dog bed to snooze on. After a long morning of wild play, the dogs actually welcome a break and quick snooze. After nap time, the dogs are again free to play as they wish, or cat nap as they please until it’s time to return home. Just like at a child day care, dog play can occasionally get pretty rowdy. A staff member constantly oversees the play groups. If a dog becomes over-stimulated or begins playing too rough, he/she may receive a “time-out” in the quite zone to calm down before being allowed to resume playing. As with children, dogs may occasionally get scratches, nicks, and scrapes from playing with others. These incidents may be treated with appropriate first aid and parents will be notified. Similar to children’s day care, they sometimes pass colds and other illnesses amongst each other, so we do ask that you keep them home if you suspect they are ill.
We also love to have parties and special occasion days, and if your four-legged family member would like to bring in treats for his/her play group, or have us help celebrate a special event such as a birthday or adoption day, we would be more than happy to help accommodate those special days. We have party hats, various decorations and will work closely with the local dog bakery for cakes and treats. We also plan special party days around the holidays. 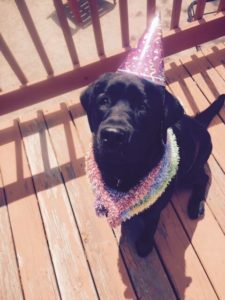 Some of our favorites are Valentine’s Day, St. Patrick’s Day, Easter, Fourth of July, Halloween, and Christmas, so if your dog is a party animal, be sure to ask when we will be partying so we can get him/her on the schedule! We will respect all dietary restrictions simply let us know.